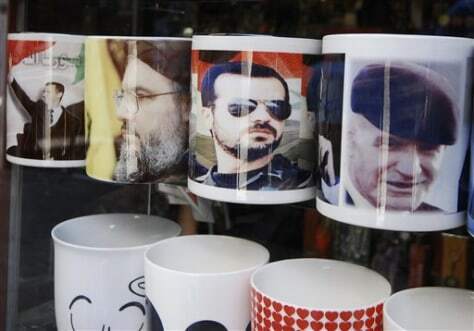 Souvenir mugs with portraits from right to left, late Syrian President Hafez Assad, his dead son Bassel Assad, Hezbollah leader Sheik Hassan Nasrallah and Syrian President Bashar Assad, are seen displayed for sale, in the old city of Damascus, Syria, on Sept. 3. Activists say Syrian security forces cracking down on a growing uprising have killed two people after storming a northern village. The security raid is part of operations to crush almost six months of demonstrations against the country's authoritarian leadership. The U.N. estimates some 2,200 Syrians have been killed since March.